jam sot para jush jovetem ne emrin tim personal por edhe ne emer te te gjith pasardhesve te Kapidanit te Mirdites Gjon Marka Gjoni te cilet ju percjellin pergezimet me njerzore per vlerat dhe traditat qe po ruan Mirdita. Dera e Kapidanit te Mirdites si sot 100 vite me pare percolli per ne parajse prijesin dhe fisnikun e saj Preng Bib Doda. Nji Patrioti mund ti hiqet jeta por jo lavdia. Sarajet e Oroshit ; Kullat e Bib Dodes ne Shkoder , Bajraket e Mirdites e konsujt , patriotet e mbare vendit e priten Preng Bib Doden tek kthehej nga internimi ne tokat turke si Princin e Denje dhe te rralle per dije e bese. Traktatet antishqiptare nuk e dinin se Mirdita Arbnore do te perfaqesohej si gjithmone nga burra te shquar e te dijshem trima e atdhetare.Por jo vetem kaq.As perandoria otomane nuk do ta kishte besuar se nen hymnin arbnor Preng Bib Doda do te behej pjese e rendesishme e Shpalljes se Pavaresise ; do te behej Minister disa here dhe se do te thirrej edhe ne Paris si nenkeyetar i Konferences se Paqes. As trojet tona nuk e mesuan deri vone se cfare humben me humbjen e Preng Bib Dodes. Te dashtun Vllazen e motra. si sot nji shekull edhe sot ; familja e Kapidanit te Mirdites perulet para djalit dhe fisnikut te saj te shquar Preng Bib Doda dhe falenderon gjithashtu te gjith ata qe jane angazhuar ne nje kujtese te tille. 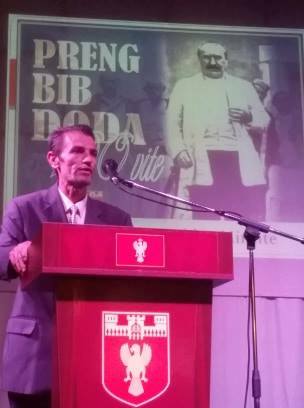 Dera e Kapidanit te Mirdites mirenjeh dhe shpreh mirenjohje per te gjithe ata qe u mesojne brezave historine e drejte dhe te vertete te Kombit dhe te Mirdites. Dera e Kapidanit te Mirdites e vlereson aktin e dhenies se emertimit Preng Bib Doda rruges se hyrjes per ne qytet si nje akt te duhur dhe atdhetar. Portreti i sotem i Mirdites ka me shum vlere kur vete Mirdita u jep vendin e duhur historik te gjithe patrioteve te saj. Si sot 100 vite me par as dera e Kapidanit te Mirdites nuk e dinte se Mirdita vetem pas nje shekulli do ta perjetesonte prijesin e saj. Por qofte kjo rruge Rruga e Bekuar se ciles ardhshin miq e kohe te begata per Mirditen dhe 12 bajraket e saj te lavdishem. Zoti e ndertofte te nesermen e mirditoreve ashtu si ka qene endrra dhe deshira e Prijesit dhe e te gjithe Patrioteve te vendit tone. Zoti i paste nen kujdes fatet e se ardhmes dhe zoti u kujdeste per shpirtrat e te gjithe atyre qe e dashten Atdheun. Rruga Preng Bib Doda sjellte ne zemer te Mirdites pergjithmone Pashke e Keshnella te lumtura. Me perqafime per te Gjithe! Me 25 Mars 2019 kremtojme 100 vjetorin e vdekjes se Prijesit te Mirdites, Preng Bib Doda. 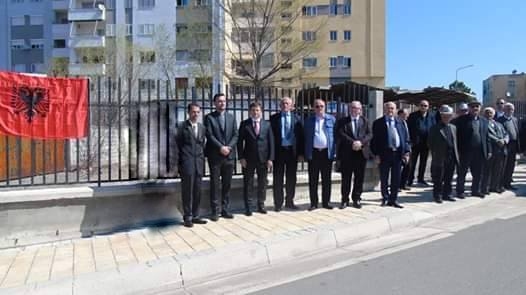 Dera e Kapidanit, duke falenderuar Bashkine dhe Keshillin Bashkiak, njofton opinion publik Mirditas dhe atë mbare Shqiptar se me date 25 Mars 2019 organizohet ceremonia e emertimit te rruges “Preng Bib Doda”, nga kjo Bashki. Dera e Kapidanit në kete eveniment do te perfaqesohet nga Z. Artan Lleshi Gjomarkaj, i cili do te mbaje edhe fjalen pershendetese me kete rast per te pranishmit.</p? 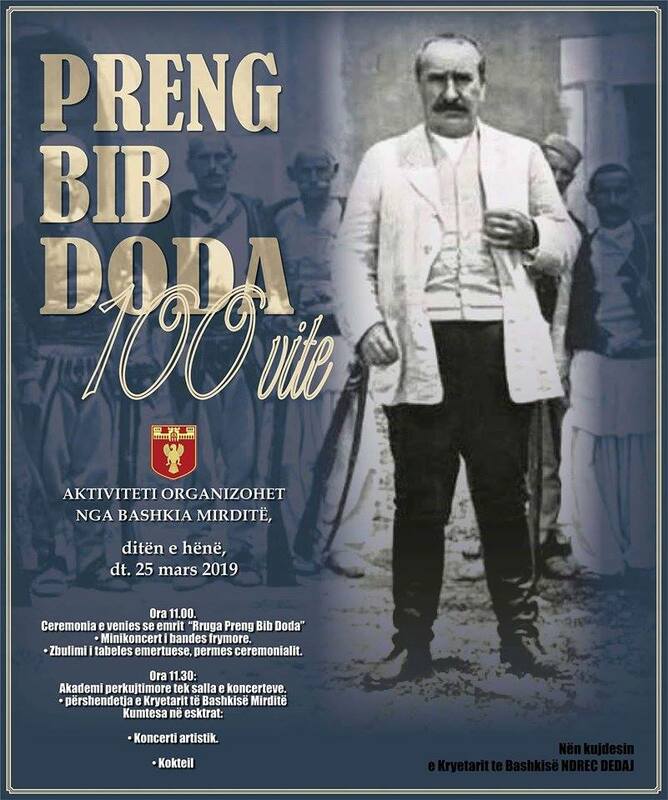 On March 25, 2019, we commemorate the 100th anniversary of the death of the Leader of Mirdita, Preng Bib Doda. 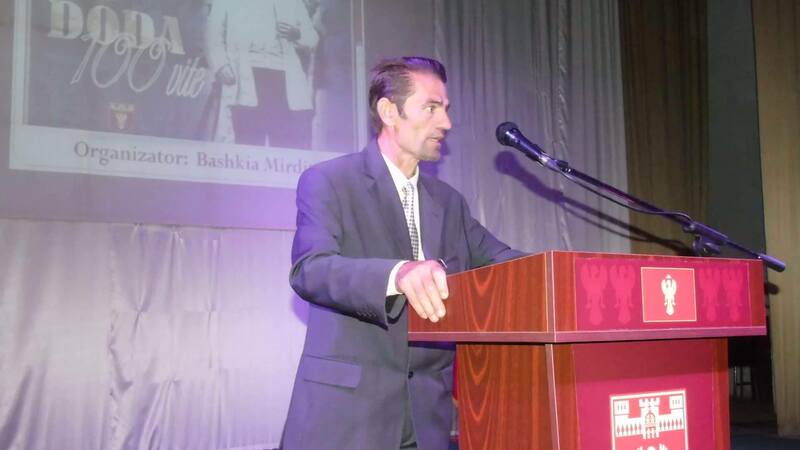 The Kapidan’s House thanks the Municipality and the City Council for the public acknowledgment of Mirdita and notifies all Albanians that on March 25, 2019, the ceremony naming a street after “Preng Bib Doda” is organized by this municipality. The House of the Kapidan at this event will be represented by Mr. Artan Lleshi (Gjomarkaj), who will also present a welcoming speech for the attendees. The Order of George Kastrioti Skanderbeg was bestowed on the House of Gjomarkaj on March 29, 2017 by then President Nishani by Decree no. 10105 for the following reason: “For the extraordinary contribution in the service of the protection of the national identity and in particular of the Mirdita region, for the centuries long struggle against the invaders of the homeland and for their resistance to them. For their noble sacrifices against the establishment of the communist dictatorship in the Albanian territories “. This video was created by noted Albanian folklore singer Paulin Gega in honor of the House of Gjomarku. It was shot on location at the historical Kulla Markagjoni in Shkoder. This Kulla or Tower is part of the private residence which once belonged to Prince Preng Bib Dode and subsequently to Kapidan Gjon Markagjoni. The house is currently owned by the legal heirs of Gjon Markagjoni; his surviving son Kapidan Nikoll Gjomarkaj, his grandson Gjon Ndue Gjomarkaj, his nieces Kristina Markagjoni Vata, Celestina Markagjoni Deda, Maria Cristina Gjomarkaj (Markagjoni) Verger, Bianca M. Gjomarkaj (Markagjoni) Nakovics and Alessandra Gjomarkaj. Enjoy! My father, Ndue Gjon Marku aka Ndue Gjon Markagjoni and Ndue Gjomarkaj, was the second oldest son of Kapidan Gjon Marka Gjoni, the leader of the Gjomarkaj tribe in Mirdita. Their stronghold was Orosh, the seat of their House, which for over 500 years remained vital to the stability, longevity and continuity of the highlander’s way of life. Their story is one of courage, bravery, suffering, triumph, and sacrifice………. Sot është gjashte vjet që babai im i dashur vdiq. Ne humbasë atë çdo ditë! Today marks six years since the passing of our dear father. We miss him every day! Sot unë kam botuar librin e babait tim për herë të dytë. Ai së pari botoi këtë libër në vitin 2002 dhe pas 14 vitesh unë ndjeva se ishte e rëndësishme që të publikojë atë përsëri. Ky liber ka ne fokus te tij, gjenezen e Kapidaneve te Mirdites, si dhe disa saktesime mbi kanunin e Mirdites sipas Ndue Gjomarkut, pa harruar dhe ngjarje kulmore historike te cilat jane domethenese per fatin e Mirdites dhe te shqiptareve. Duke perfshire nje periudhe kohore disa shekullore.Për të blerë librin, ju lutem ndiqni këtë link. Today I re-published my father’s book. It was first published in 2002 and after 14 years I felt it was very important to publish it again with a wider distribution. The book focuses on the Kapidanis of Mirdita and the impact of the Kanun on the region over a period of several centuries. The book emphasizes a number of historical milestones of the Gjomarkaj household mainly concentrating on the Markagjoni branch (my grandfather, father and uncles). I hope to have it published in English within the year. The book is in Albanian and may be purchased through Amazon at the link below. My name is Bianca Maria Gjomarkaj Nakovics. I am the daughter of Kapidan Ndue Gjon Markagjoni (Gjomarkaj), grand-daughter of Kapidan Gjon Markagjoni. 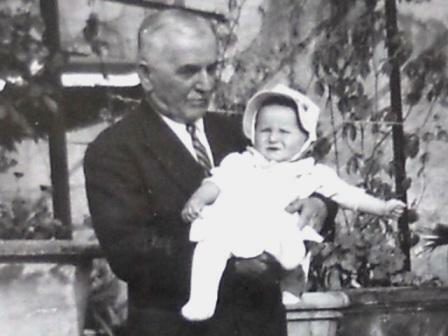 The intention of this site is to provide accurate historical facts about my family, especially my grandfather. Much is published on the internet about his background, some of which is distorted and untrue. I hope that in my research and subsequent findings I will be able to share with you the true character of a great man, as well as a heartwarming view from his second eldest grand-child about his life as a political refugee in Rome, Italy. I loved my grand-father very much, he was known to me as Baba Gjon. He lived with us in Rome, Italy, from the day my parents were married in 1957 until his death in 1966. He was a kind man, and a gentle man. All my life I heard stories of his heroism and achievements, and although felt very proud, I loved him more as a grandfather than anything else. He was my Baba. I’d sit on his lap and he would recount stories of the “old country”. He would take me on walks in the streets of our beloved Rome. He would try to teach me Albanian, which I deeply regret not learning in full, but is something I am working on. I hope to share with you the stories of my father, aunts and uncles, some of whom died before their time and others who suffered tremendously at the hands of communism, which had a stranglehold on the country for almost 50 years. It wasn’t until 2010 that I finally made my journey to Albania, to the homeland of my father and his father and all the others before them. 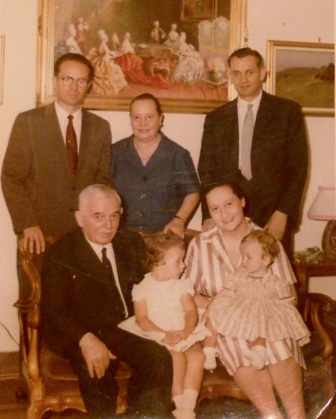 I was both overwhelmed and elated to meet my uncle Deda, aunt Bardha (my namesake), my cousins: Kristina and Celestina and many others, all of whom welcomed me with open arms and loved me as though I had known them all their lives. When I looked in their eyes I saw only happiness and optimism, strength and endurance, and was amazed at their resilience. Some of them suffered in internment camps and prisons from 1945 until their release in 1991. They saw their family and friends die before their eyes and suffered with them. They witnessed their home in Mirdite burn with all their possessions inside. They lived through unimaginable suffering and torture. These were my people and I was proud, so very proud to finally have met them and call myself Gjomarkaj. I finally understood all that my father tried to tell me when I was growing up, about the struggles of the “old world” that I, as a self-involved teenager, could not fathom nor really cared to hear about. I finally understood all the suffering this family went through, not only for their beloved country, but for their name and for all of us who came after, so that we could inherit the honor of the name and be proud to belong to such a great family. I have since relocated to Shkoder to live closer to my relatives in my grandfather’s home. My husband and I have been here since November 2012 and in this short period of time we have have had great days and made some wonderful new memories. I was very blessed to have been able to make the transfer at that point and time in our lives because it gave us the opportunity to live near my dear aunt Bardha the last four months of her life. It was with great sadness that we lost her on March 19, 2013, only a couple of weeks after her 86th birthday. I know that us being here made her very happy and that comforts me every day, we miss her terribly. I would like to thank Tome Mrijaj for his friendship to my father and for his insight, advice and input which helped me to recreate the history of my family as accurately and specifically as possible. 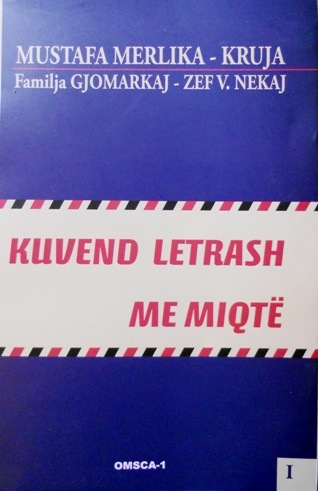 This book was published by OMSCA-1 in Tirana. It is a collection of letters dating from 1944-1958 between Mustafa Kruja, Kapidan Gjon Markagjoni, Kapidan Ndue Gjomarkaj and Zef. V. Nekaj. The book is very interesting and a labor of love by Eugjen Merlika, grandson of Mustafa Kruja. The book can be purchased from OMSCA-1 Rr. Frederick Shiroka, Kutia Postare: 8298,Tirane 2012. Tel 2 2336 48, email:omsca@abissnet.al. Questo libro e’ stato pubblicato da OMSCA-1 a Tirana. 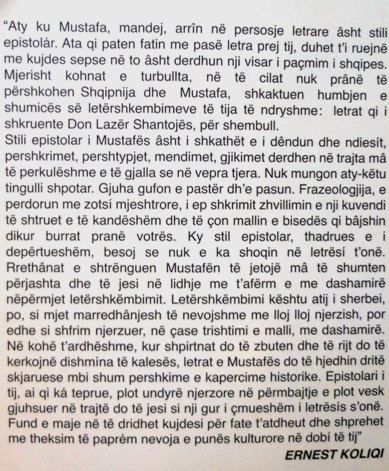 E’ una collezione di lettere private fra Mustafa Kruja, Kapidan Gjon Markagjoni, Kapidan Ndue Gjomarkaj e Zef. V. Nekaj. Il libro è molto interessante, dando conoscenza alla continua lotta per liberare l’Albania da un gruppo di personalita nazionali che vivevano in esilio. E ‘veramente un lavoro affetuoso da parte di Eugjen Merlika, nipote di Mustafa Kruja. Il libro si puo’ comprare da OMSCA-1 Rr. Frederick Shiroka, Kutia Postare: 8298,Tirane 2012. Tel 2 2336 48, email: omsca@abissnet.al. Austrian Pastor Franz Winsauer, founded a small private volunteer organization in 1991, “Projekt Albanien”, which focuses on providing relief work to a very targeted, inaccessible mountain region in the north of Albania with about 37,000 inhabitants. This is a not for profit organization with supervised manageable projects which promote a positive development in the region. To visit the site please click on the logo box above. Your donations would be most appreciated. The Albanian Rehabilitation Center for Trauma and Torture (ARCT) has been operating in Albania since 1995, designing and implementing programs aiming to contribute in building a democratic society, without use of torture in a country where strong political persecution had been present for almost 50 years during the 20th century. I have a picture of many of the powerful patriots of Northern Albania during the time they were forced to flee their home. One of the men look like your father; if not must be a relative. I believe he had Kapidan Mirditz. Where can I email you the pic?